Description: 5 foot 4 inch - 17,000 pound - tiger skin granite fountain - Customer moving - Must sell - make offer The ball is 64". The collar is 76" and 20" tall. The collar has a 12" overflow channel that pours in to a trough. The granite trough is 34" long and 18" tall and 17" wide, that feeds into an ABS ground pond. 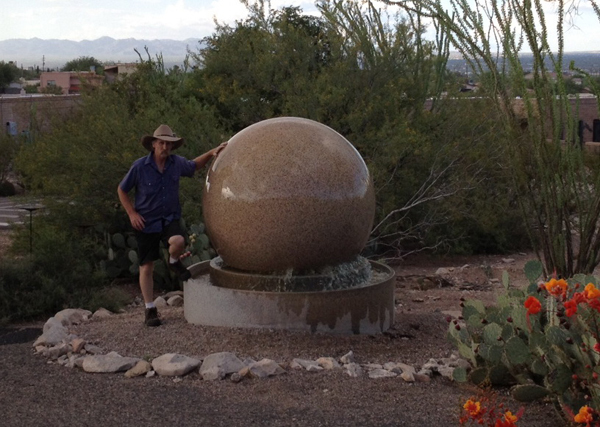 The pedestal is a granite octagon 44" and 22" tall. It also comes with a 1.5 horse power pool pump. When it is assembled on the pedestal it is 8.5' tall.